Ochre and Umber are truly "The best bargain in the pigment industry." What are Ochre and Umber? Ochre (pronounced o’-ker) is a natural, mineral, earth pigment. Chemically, it is a hydrated ferric oxide, chemical formulation: FeO(OH). Ochre is inorganic, chemically inert, non-reactive with cement, mortar or brick, and non-toxic. New Riverside produces two grades of Ochre pigments that are called 548 Ochre and NIROX 412. 548 Ochre is slightly darker. NIROX 412 is more yellow and has a greater tint strength. Ochre is mined and processed in Cartersville, GA at the only year-round Ochre mining and processing operation in the United States. How is Ochre used? Ochre can be used alone as a single pigment to achieve a range of colors from light buff to dark buff simply by varying the addition rate. As a way to achieve a broader range of colors with a higher yellow or red shade, Ochre may also be blended with synthetic pigments and used as a cost effective base. 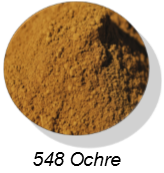 548 Ochre is a brown-yellow, refined natural iron oxide pigment (Fe₂O₃) with an average particle size of ~3 microns. It is the most economical buff color in the pigment industry. Broad application use for all cement applications. 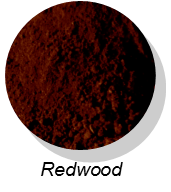 Umber is a controlled product from a manganese enriched form of goethite, a naturally occurring inorganic iron oxide. 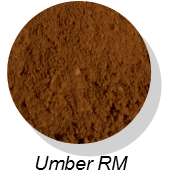 It is a brown earth pigment that is darker than the Ochre because of its manganese and iron oxide content. 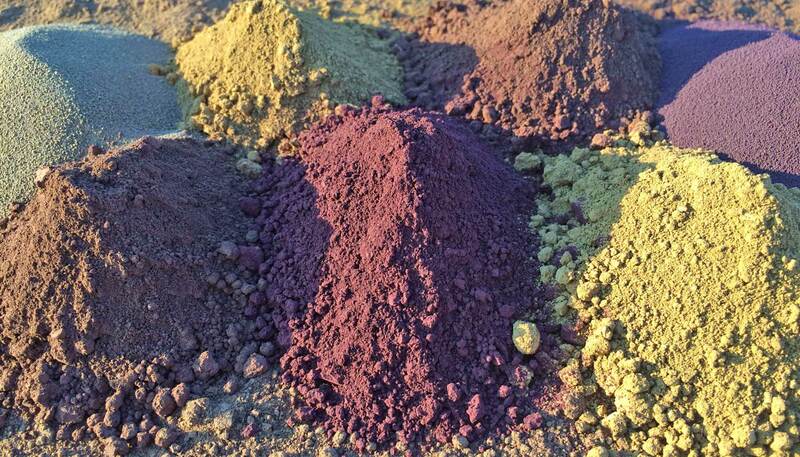 It is highly valued as a permanent pigment either in the raw or burnt state. Umber is lightfast, insoluble in water, resistant to alkalis and weak acids and non-reactive with cement, solvents, oils, and most resins. How is Umber used? Raw Umber can be used to achieve a range of brown colors simply by varying the addition rate. Burnt Umber may be used as the base for producing more reddish brown shades. Umber RM is a controlled brown, raw umber pigment with an average particle size of ~3 microns. 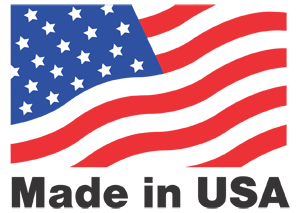 It’s cost effective pricing make it suitable for a broad range of applications. It is also available as Umber RM XF, which is an extra fine powder that is ideal for the coatings industry and capable of meeting a 7 on the Hegman scale. Redwood (Burnt Umber) is a milled, calcined umber with good heat stability and suitable for all concrete applications. Also available as Redwood XF, which is an extra fine powder that is ideal for the coatings industry and capable of meeting a 7 on the Hegman scale. Cost Performance: Economy and versatility are the primary reasons why ochre and umber pigments have enjoyed over 110 years of success in the pigment industry. Economical: Ochre and Umber are the most economical buff colorants available today. Ochre based blends repeatedly outperform synthetic iron oxide colors where earth tone shades are desired. On jobs ranging from a residential driveway to a 100,000-plus cubic yard drainage canal, ochre has been chosen because of its economy and performance quality. Permanence: Because Ochre and Umber are iron oxides, their color is permanent. They will not fade or wash out. 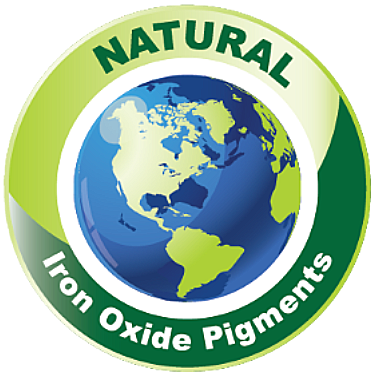 The cave paintings by prehistoric man, as well as the earth pigments used extensively in Renaissance art, attest vividly to the beauty and permanence of natural iron oxide pigments. Ease of Use: As natural pigments, Ochre and Umber blend easily and uniformly in all applications. Custom Colors containing Ochre and Umber as a base can be formulated to create a new “natural” range of color. Ochre and Umber products are available in 50 pound bags, super sacks, and bulk tankers. Custom packaging is also available.